Vojanovy sady (eng: Vojanovy Gardens) rank due its size of 2,5 hectars among the smallest and at the same time nicest and oldest Prague´s gardens. They are located in the very centre of the historical Prague. The gardens are surrounded by a high build-up area of houses and walls which protect them from the city noice and create a completely intimate ambient. The first impression a visitor gets is total silence and peace. Should the visitor have an a priori feeling that it is necessary to see free nature or have an attractive view this impression will pass soon. He/she feels will namely feel perfectly alone in these gardens. 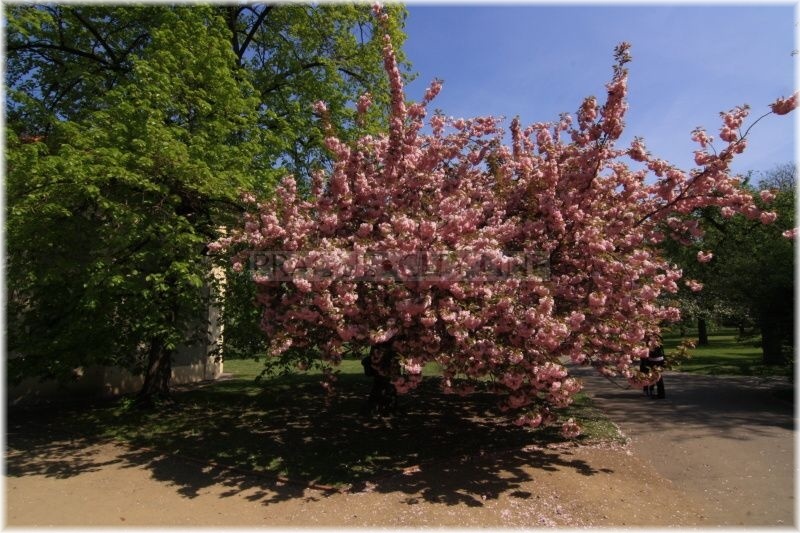 The garden was founded together with the Bishop´s Court originally as an orchard already in 1248. Its area was definitely defined by the two palaces from the North by the Thurn-Taxis Palace and Windisch-Grätz Palace and by the church of St. Joseph from the West which is part of the convent of the Barefoot Carmelites. 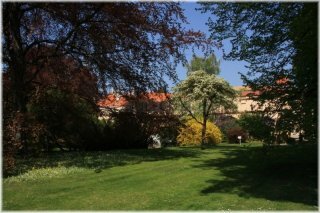 A great part of the estate buildings was destroyed during the Hussite wars and the garden was parcelled and sold to Prague´s citizens. Only under Ferdinand III in the middle of the 17th century it was bought back again, reunited as a plot and donated for the use to the Barefoot Carmelites. They gradually built their own convent and church of St. Joseph in the premises and a richly decorated chapel of St. Elias in the garden. The garden was solely used as an orchard at that time. Gradually some new buildings and structurally-decorative elements occured in the garden such as the Baroque chapel of Santa Teresa and by a staircase separated view terrace. At the end of the 18th century the garden became the property of the society of the English Virgins and it also received another purpose. It was slowly turned from a fruit garden into an English park and the appropriate modifications were also changing its appearance. Newly a fish pond, decorative coniferous trees and other decorative park trees occured. 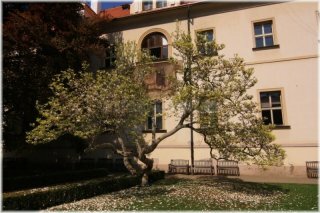 In 1921 the garden became the property of the independent Czechoslovakian state and became part of the premises of the Ministry of Finances. It was deteriorating for a while and only in 1954 it was definitively opened to the public. Some more architectural historical gems such as a quarterfoil-shaped fountain or a sun dial had were discovered and gradually sensibly restored and put into operation and are currently opened for sightseeing. Nowadays the garden serves to the general public as a place of rest and for mental relaxation offering fairly sacred.silence. The whole garden appeals very pleasant and well-maintained. A visitor can only enter it through one access – a gate in the wall from U Lužického semináře street. Despite being in the middle of high building estates the visitor will only perceive the present green. The path on the right will take him between the trees to the decorative fish pond and further between the well-maintained flower beds and a glasshouse to a staircase which leads to the renovated fountain. If he looks to the right he will see a historical gem – a sun dial which „really really goes“. The way back leads among high-grown and still bearing fruit trees. The garden is the most beautiful in the late spring when it blazes with colours and scents. Besides the fruit trees you will also find magnolias, rhododendrons and gorgeously and sensibly modified flower beds with a current offer of flowers. The impression of the view is completed by singing of the nesting birds and occassionally even a bit unpleasant shrieks of the peacocks which freely wander through the garden and look attractive (which cannot be said about their singing..). Children´s corner is located on the left by the entrance away from the main paths. 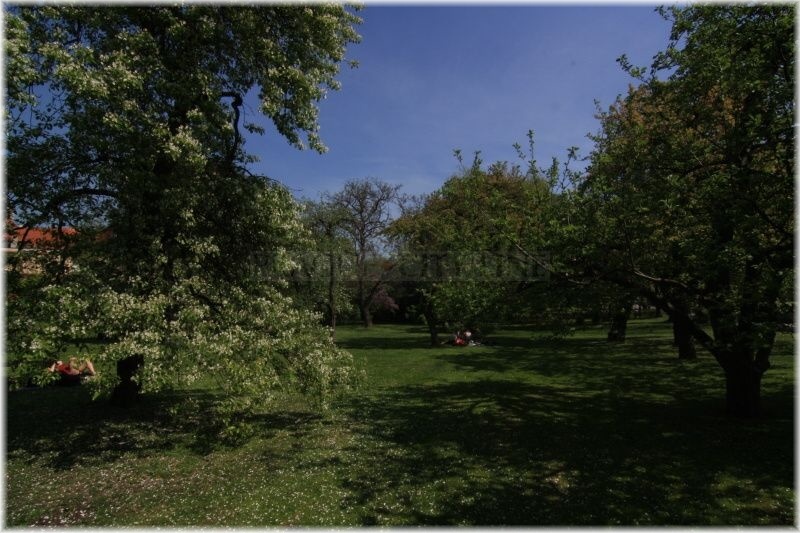 It is separated by high-grown green which absorbs the sounds of possible children´s loud manifestations so that children and adults do not disturb each another. In the playground moms will find a place to rest and their offsprings enough attractions to play and for the safe motion. You will find no restaurants or snack bars in the garden but do not worry – all around there are many well-equipped places where you can eat and drink well. 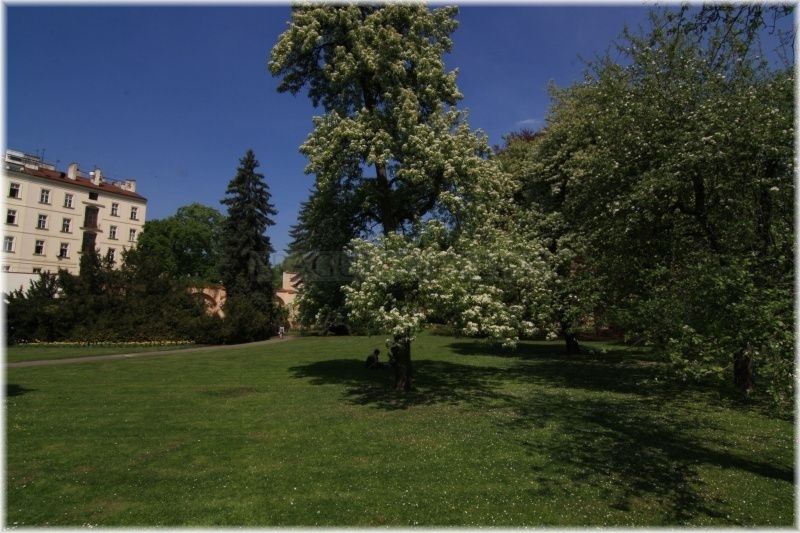 Dogs are not allowed to enter Vojanovy Gardens which is due to its purpose and ambient fully comprehensible and even desired. Vojanovy sady is a beautiful garden determined for the peace of mind in particular. If you do not want to sit you can walk through and view it quite fast which, however, is not its purpose. 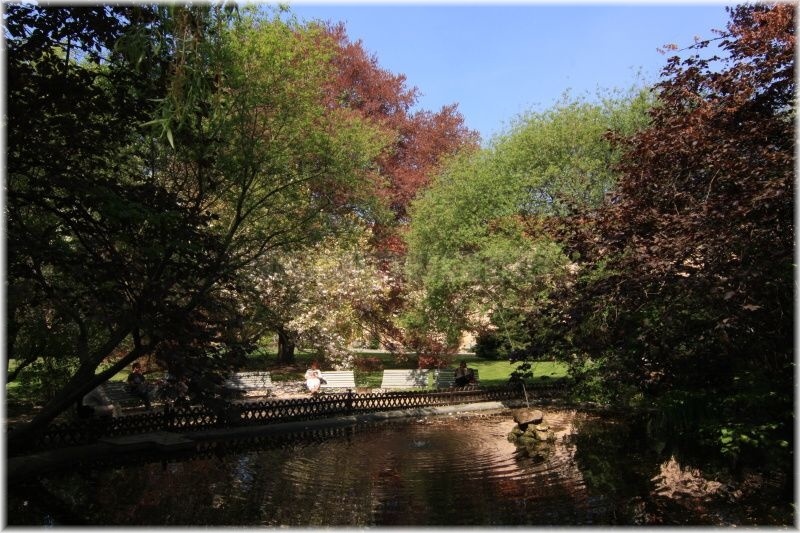 It is a place of quiet peace and asylum of tranquility and relaxation for the visitors of all age groups. Its hospitable arms provide everything what the nowadays exhausted and stressed man may wish. Come and enjoy it. „Silence heals“ – it works here more than anywhere else. Summer from 8:00 am, evening at least until 07:00 pm. Winter from 9:00 am, evening according to visibility. From the metro/ tram stations walk ca. 200 metres along U Lužického semináře street. From Kampa park walk through Čertovka ca. 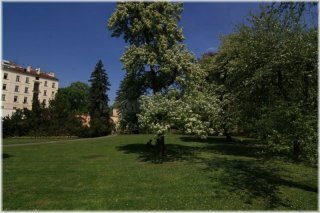 https://www.praguecityline.com/prague-monuments/vojanovy-gardens https://www.praguecityline.com/prague-monuments/vojanovy-gardens300 metres along U Lužického semináře street. From Malostranské náměstí along Letenská street, then in Klárov along U Lužického semináře street on the right – ca. 5 minutes in total.